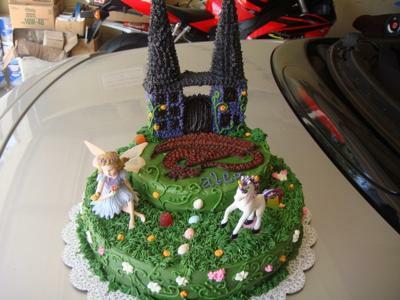 Similar to the Tinkerbell cake I did. I drew the dragon with a toothpick and then filled it in with stars. The castle is made from pieces of cake stuck together I love stars, they cover up everything. The cones on top of the castle are just construction paper with piped stars. The flowers are royal icing that I made ahead of time. The birthday girl LOVED it. What an awesome cake! I'm looking for those kind of cake toppers. can't find many unicorns yet.